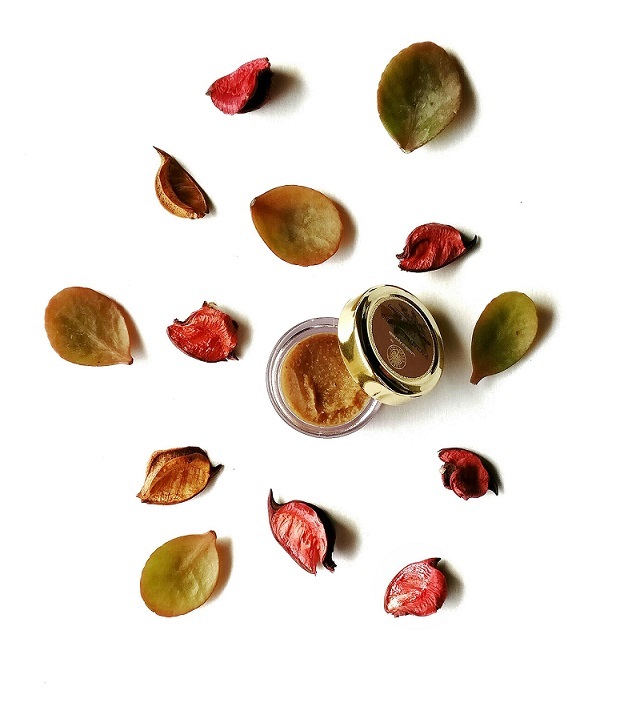 A traditional blend of rich almond, pistachio and fresh turmeric paste gently cleanses, while deeply nourishing and replenishing the skin everyday. This also contains natural hydrators including buttermilk, floral waters, organic honey and fresh aloe leaf juice to gently polish and give the skin a fine porcelain texture. Organic sweet almond paste, Pistachio butter, Steam distilled rose water, Aloe Vera juice, Organic honey, Organic turmeric paste, Fresh cucumber extract, Passion fruit oil, Vitamin E, Vitamin A, Cows Milk. I think pretty much everyone must be knowing about the luxury ayurvedic brand Forest Essentials and how supremely expensive their products are, so upon getting a sample of their cleansing paste in my envy box had me very excited. It was actually the star product in their October edition. Though, I'm not gonna lie and say, I was a little disappointed with the sample size. I wish the quantity was a bit more. But, even this much quantity costs a whopping Rs.900. Yes, you read that right ! And the full size retails at Rs. 1870 for 30g. This may compel you to think, Why are their products so expensive ? Well, if the word luxury wasn't enough to fulfill your curiosity, let me tell you a little about this brand. Forest Essentials, an Indian beauty brand harmonizes the methods of ancient Indian ayurveda with modern aesthetic. Their philosophy is based on Panchmahabutas (a theory that states that everything in the physical creation is composed on five elements: space, air, water, fire and earth). Handmade products with high standards of quality and, the use of only organic cold pressed oils, rare plant extracts and steam distilled essentials oils makes FE a luxury treat for your body, skin and hair. 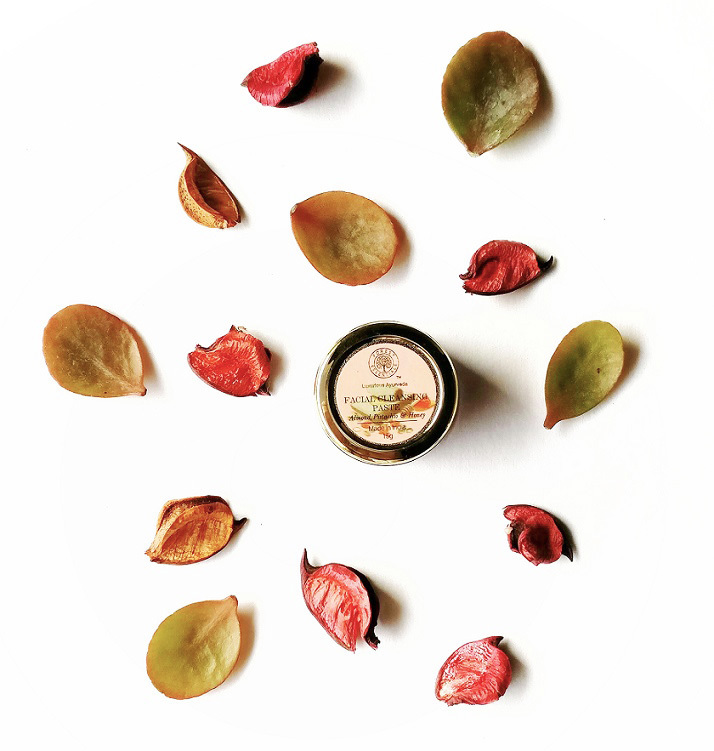 Let's talk about the almond and pistachio cleansing paste now. Since I got the sample size, I won't be able to talk about the long term effects of this on skin. The cleansing paste is housed inside a tiny tub packaging with shiny gold cap. Even, in this tiny tub, it looks quite luxe and, the fragrance, oh my god ! it smells so edible, just like a delicious Indian dessert. Texture wise, it's thick and has muddy brown color. Since, the texture is quite thick, it feels more like a face scrub but, not abrasive at all. It doesn't produce any lather and feels very gentle while rubbing on skin. Post cleansing, my skin felt clean and nourished. Also, it leaves skin feeling moisturized too. However, I did notice slight oiliness on skin but applying a matte face mask after this will suffice. Overall, I really liked treating my skin with this all natural and organic cleansing paste. I've hardly come across any negative reviews about FE products, so if you want to give your skin a nice and luxurious pamper session, go to their store or website or Nykaa.com to buy products according to your particular skin type. Have you tried any of forest essentials product ? I haven't tried any products of forest essential but would love to give it a try. Nice review. While I'm not sure if the oily feeling that this paste leaves behind would work with my already oily skin, this sounds like a great quality product. The ingredient list alone makes it sound almost like a dessert! Serene Sparkle Instagram Giveaway ! !